166 pages | 8 B/W Illus. Much of our understanding of local economic development is based on large urban agglomerations as nodes of innovation and competitive advantage, connecting territories to global value chains. However, this framework cannot so easily be applied to peripheral regions and secondary cities in either the Global South or the North. This book proposes an alternative way of looking at local economic development based on the idea of fragile governance and three variables: associations and networks; learning processes; and leadership and conflict management in six Latin American peripheral regions. The case studies illustrate the challenges of governance in small and intermediate cities in Latin America, and showcase strategies that are being used to achieve a more resilient and territorial vision of local economic development. 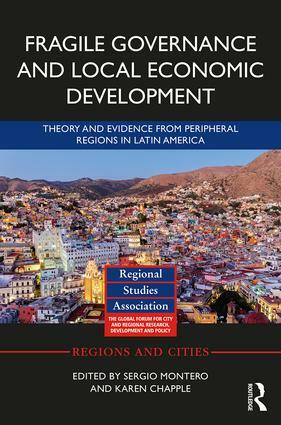 This book will be of interest to students and researchers of local economic development, urban and regional studies, and political economy in Latin America as well as to policy-makers and practitioners interested in local and regional economic development policy. Sergio Montero, Ph.D., is Assistant Professor of Urban and Regional Development at CIDER (Centro Interdisciplinario de Estudios sobre Desarrollo), Universidad de los Andes, Colombia. Karen Chapple, Ph.D., is a Professor of City and Regional Planning at the University of California, Berkeley, USA.